Carayol has always had ability. He is a player who seems to have fallen foul of the Buckle style of management ie if you are disliked you don't get in the team. Caryol certainly does have ability, but he has had to appreciate that he cannot play as a pure winger within the Plainmoor set up..................or many pro' set ups for that matter. It's not a matter of a manager "liking him", but preferring at the time to use another player with his different approach to the role that he is in consideration for within the team. It's very difficult for wide players these days and very demanding as very few managers play with pure wingers per se, instead wide midfield players are expected to get up and down that touchline, pull out wide to provide an "out" for the others to pass to in a pressure relieving way; track back and mark the opposition moving forward and provide cover for their own fullback behind ~ especially if that full back is going to be Kevin Nicholson ~ and until the game "stretches out" in the last thirty minutes or so; carry on doing that until he can make a decision to put getting forward as more of a priority to defensive duties. If you listen to Paul Buckle in yesterday's after match interview you will hear him allude to this and the amount of time it has taken Muzzy to take all this on board. Both Thomson and Caryol are still developing, still learning and maybe Thomson has taken a little more "persuading" from his manager at Plainmoor than was thought reasonable to have to give and was reminded of that fact when he was back at Southampton! Presumably playing Caryol on the right has allowed the more reliable Zebroski to provide the tracking back that allows Nicholson's inclusion once more........................but is that at the expense of blunting Zebs' striking power? I think playing Caryol AND Thomson in the same side at the moment would be suicidal as they cannot be relied upon 100% to do the "dirty" work that they obviously have shown less appetite or aptitude for. It's an aspect of the game they will either take on board by listening and watching players like Zebroski and Carlisle or they will drift out of the pro' game with everyone scratching their heads and asking "what happened to them?" I find myself fully agreeing with everything you have said in your post merse, Muzzy was voted man of the match for his very exciting runs he went on and such eye catching runs are always going to make any player stand out. There was a moment during the game that the whole of the main stand ended up shouting out at Muzzy, a ball had been played up by Shrewsbury just over the halfway line and Muzzy made no effort to move to the ball and try and win it, instead he stayed rooted to the spot and just stood and watched as a Shrewsbury player who dd make the effort, go and get on the ball and set up an attack. It goes without saying if you play Zebs on the wing you will lose what he has to offer upfront and the question would be for me is can we afford to lose that because Zebs is needed to offer cover for Nico. We should not forget the excellent run he made down the left in a recent home game where he then cut in to the box near the byline and set up a goal for us, so if he is playing well he still has plenty to offer playing out wide on the left hand side of the pitch. Yesterday it was more the case that Zebs was poor on the ball most of the time, his attempts to go past any Shrewsbury player especially in the second half, were very half hearted in my view and he also got a bit of stick for bottling a fifty fifty ball near the halfway line. Nico had an excellent game again yesterday and clearly showed he is more than good enough to play in this league, were the Shrewsbury defenders as slow as he is? is that why Muzzy went past them with so much ease at times? its not always just about pace, but how that pace is applied, and even those not so gifted with pace, can make the yard or two they will need to deliver a cross by out foxing their marker by making a quick dash past them. Yeah, he's still raw but much better than last season. He seems to have bulked up a little as well. I still shouted a bit at him yesterday. There were a couple of occasions when Rendell held the ball up, Benyon wasn't available, and instead of sprinting up the line to give him support he just ambled along at a pace even I could keep up with!! But like a lot of young wingers who like to dribble he's better with the ball at his feet than without it. I share the concern that he might bugger off when he contract expires but I hope he agrees a new one. Hopefully he's intelligent enough to realise that the manager was right not play him in every game or send him off to sunny Kettering. Well if Muzzy does become available, I think a fair amount of Shrewsbury fans would take him! Just on a general point about Zebs - yes, his defensive tracking back is important, and yes, he made one or two tracking back tackles yesterday, however, these tackles were made when his own poor control, doppyness or poor decision making had got us into trouble. I like Zebs, but lets not pretend that yesterday he was anything but a liability in his position in midfield. Strangely for Zebs, I also thought there were one or tow 50/50 or even 60/40 challenges which were lost becuase the oppostion player appeared to want it more than he did. Maybe he is carrying a knock? He certainly did have two (that I know of) scouts from the topflight take a look at him very early last season. Drifting in and out of the team and moving on loan to Kettering would surely rule-out such interest now. I couldn't see him being swamped with offers, but Paul Ince rated him very highly and I'm sure would provide a good word for any other clubs thinking of making an offer. Carayol has been very frustrating. For every step-over and cracking strike on goal there are two or three games without a huge amount to write home about. However, he has really started to improve at this stage of the season - not easy in a struggling team - he's also a young player with raw talent and perhaps if we are in league two next year and start from scratch again he will progress further. Other than the pre-season, the first signs I saw that he was offering more as a team player was the dismal team display at Hereford a couple of months ago. He worked extremely hard, was disciplined in his positioning and covered a lot of ground without the ball and did track-back. I don't think he has the acceleration and directness that Jake Thomson offered when he first arrived, but he gives a whole lot off other things that are far more important when the team is struggling at the bottom of the league. B) Thanks for the support. Me, it looked like an A.
I agree with what you say about Carayol, but it does appear with Thomson that his application does not match his talent and I would side with the manager if indeed as seems likely that Thomson does not feature anymore this season. Its a shameful waste of talent really but it seems like Jake is his own worst enemy. He is good enough ability wise to be a regular but you do wonder if he really is a player who isn't going anywhere. Dave's picture of Mark Loram bought back a few memories (talking of a shocking waste of talent by the way). What a player Loram was, absolute quality. Agreed, but also what a pillock and to have pissed his career up against the wall of life; what a waste! Instead of being a local legend in the small time of the game, this guy could and should have been up there with the Wayne Rooneys of this world, played for England and been a world class player with wealth and reputation to match. In my opinion, Mark was better than Lee Sharpe and I know Bruce Rioch reckoned his left foot was as good as any in world football. Having observed him at close quarters whilst refereeing, I can testify there was nothing wrong with his football brain, it was the "other one" that was the problem! If he's telling fans at Bideford he'll not play again, he can do one as far as I am concerned. We need people for a scrap. Its a pleasant surprise to me that Carayol seems up for such a scrap. If he begs, consider him. I find it surprising that he didn't track back, what with coming to us with an international cap at right back. If he applied himself, he could have made that right wing slot his own. Silly boy. How many teenage players from higher clubs think they are better than they are? One common denominator. With that attitude they are not. In all fairness to Thomson he didn't say anything at Bideford, he actualy said it the following day and it was because of his peformance in the Devon Cup, although I don't think he was any worse than anybody else in that game. That of course could of changed because Macklin went back and we did not sign someone else so he could well still be here for all I know. Yes Loram could and should have made loads of money. 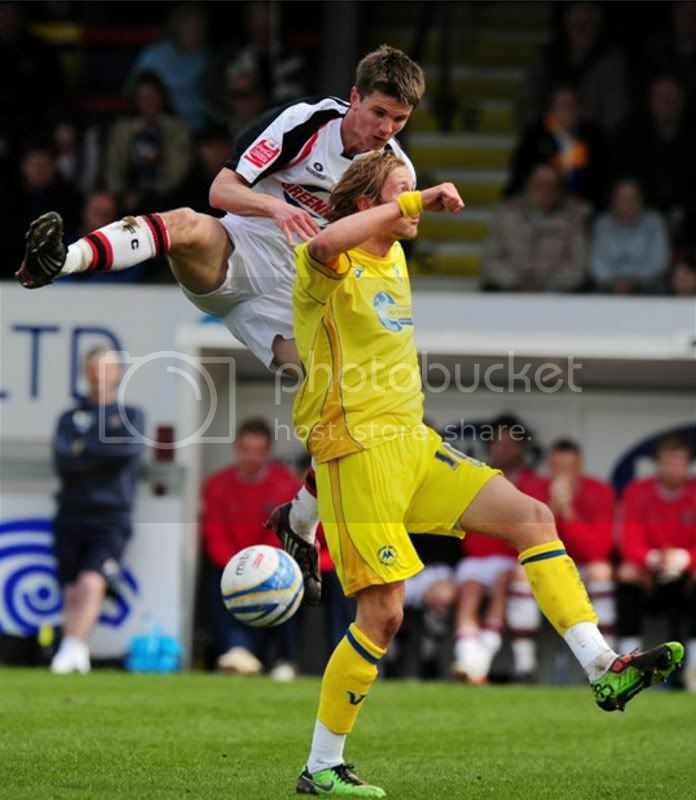 He was one of my all time favourite Torquay players though, flawed genius maybe but boy was he good. Oh I'm so glad that at last some "fairness" is being shown to Jake Thomson, now how about some being shown to Paul Buckle? So just how does talking to the following day (and to whom?) relate to talking to someone "at the match"? You see, this is the problem isn't it....................People go to matches, talk to players or over hear their private conversations; and interprate their demeanour (which is hardly going to be one of joyous ecstasy) on not being selected, in the wrong way. Not many players make good or willing spectators, and not many players really believe they are not good enough to make the starting eleven. Can't we all be a little more grown up over this and stop reading something into nothing that equates to making five from two and two? This is no more nor no less than football isn't it. You can't operate without a big enough squad, yet a big enough squad leaves a certain number out of the picture and kicking their heels from time to time. Players having to do just that just have to accept the status quo and get on with getting their head down and working hard on the training ground to win a recall ~ just as Kevin Nicholson has chosen to do and no matter how long it takes. The alternative is to do a "Hargreaves" and seek to move or even worse do a "Woods" and throw your toys out of the pram; either way that is of no help to the club and undeserving of our sycophansy. My two scouts at Bideford saw him half heartedly run out at the start of the match, turn to Sean North and say "that's the quickest you'll see me move tonight", before playing to minimum of his ability. As for Mr Loram. He had the potential to play at the very top and he made it as far as the bench for QPR against Newcastle. Am I right in saying that Jim Smith signed him for QPR? It's a shame when players fail to recognise just how good they could be if they worked a bit harder on applying themselves. I can cast my mind back when I used to play football before I got far too porky to enjoy it. I was just average on a good day but awful on a bad day. Football must be an absolute joy to play if you have the pace, touch and poise of Jake Thomson. It's most young boy's dream to be a professional footballer and then as you go through school the best players there might have trials with Torquay, Exeter or Plymouth. At Coombeshead we had Toby Redwood (a year or two above me) who went on to play for Exeter, Greg Wilson (a seriously good striker) who I believe had a trial at Torquay, Ross Bellotti (a couple years below me) who played for Exeter and Sean Maloney (a year below me) who was on YTS forms at Torquay. I think Knowles Hill at the same time had most of the Buckland under 14 side including Anthony Lynch and Jason James (he was more or less a fully grown bloke at 14!!). Sadly none of the above ever went on to really carve out a professional career but it just goes to show that if you're good enough to still be at a professional football club at Jake's age then the perception is that you're good enough to be considered as a professional footballer. Just how far you progress is down to how hard you want to work or how ambitous you are as a player. You could open the whole Matt Le Tissier debate about how unambitious a player can be and still have a fantastic career. 444 games and 162 goals (including about 20-30 absolute crackers) for Southampton and yet I'm sure that if he'd signed for Man Utd or Liverpool then he would've had more than the 8 England caps to show for it.